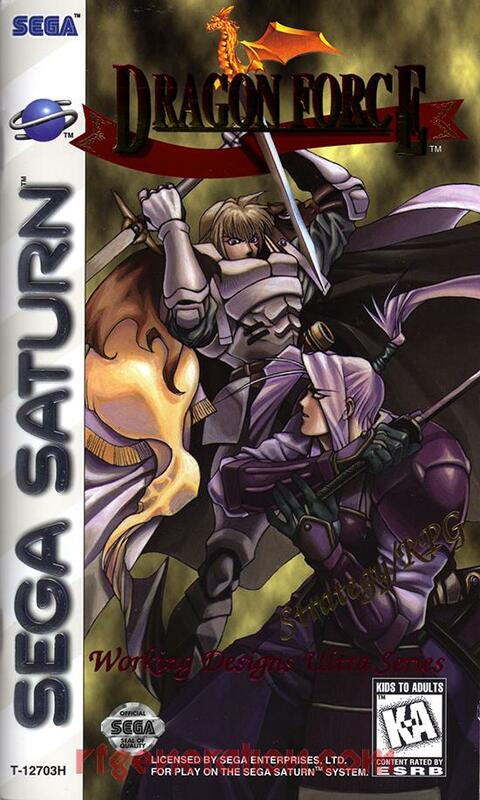 Suikoden Tierkreis was the second game to be made by Konami for a non-Sony system, but it was the first of those games to be released outside of Japan. Suikoden Card Stories is basically a retelling of Suikoden II as a trading card game and was released on the Game Boy Advance exclusively in Japan. I have no idea what I’m doing in that game, but I do know what’s going on in Tierkreis for the Nintendo DS mostly because of the English language. 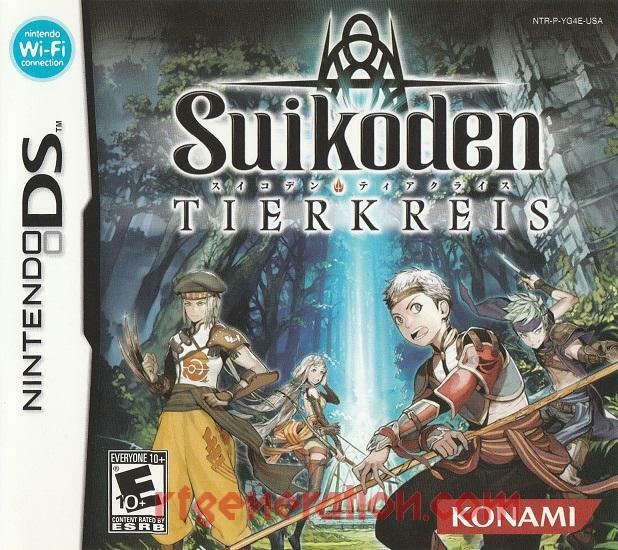 Tierkreis was the first Suikoden game since the release of Suikoden V on the PS2, and was anxiously awaited by fans of the series since there was about a three year gap between releases. 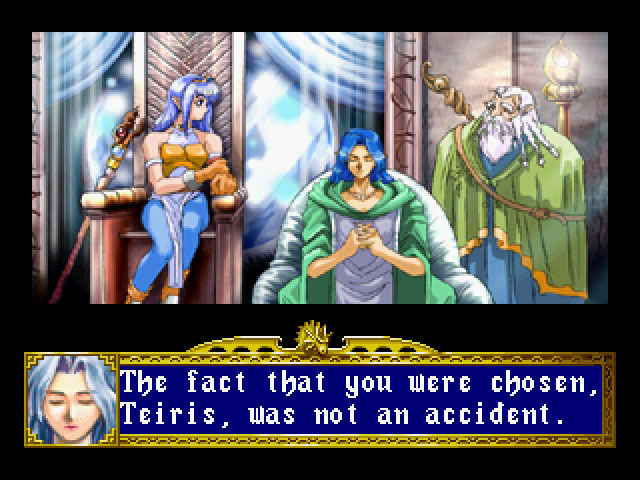 Tierkreis is a complete and total spinoff of the series. It has absolutely nothing to do with the main numbered series. As a result of this it introduces its own world with its own set of rules, all new characters, and new political entities. There are some familiar elements from previous games, such as the headquarters and 108 Stars of Destiny to recruit. This game calls them Starbearers though. Some of the most loved design choices from the main series are gone for this game. There are no tactical battles, there are no one-on-one duels. Well, technically there are some one-on-one fights, but these take place in the normal party based battle system. The familiar cinematic system of dialogue and counters is nowhere to be seen. The weapon sharpening system has been axed in favor of equippable weapons. What was a nice way for characters to have more defined personalities was replaced by the ultimate ‘throwaway character’ system. Many of the plot elements are unfolded through the job board. A number of these end up with the recruitment of more Stars, but some are just there for money making purposes. Thankfully, not all recruitments involve this board, so you still have to explore towns and other areas to find out where people are hiding out. You make most of your money in this game by actually moving the plot forward, as you can turn in these missions at the job board to earn a big paycheck. This game still focuses on political machinations and the various ambitions of the independent rulers of their respective areas. Unlike the main games there are many different nations, kingdoms, tribal areas, and cities all within the game world. There is a religious, militant, zealous imperial styled country, a magical kingdom, a city of porpoise people, a tribe of felines, a kingdom of swordsmen, as well as smaller villages. Tierkreis’ world is described as being much larger than just the explorable area, as there are many worlds connected by gateways. There is another tribe that specializes in using these gateways to travel between worlds and use items they find to trade in other worlds. This also lets characters from other worlds visit your own, but sadly the reverse is not true. It would be awesome to have small areas to explore in other worlds while keeping the plot focused on the main world. This is not completely unique to this game though. 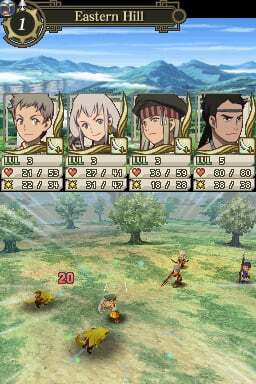 The idea of other parallel worlds existing has been blatantly mentioned in previous games, including the first two, Suikogaiden II, Suikoden IV and Tactics. Some stars of those games are theorized to be from other worlds, but this idea was never the focus of any of the stories from those games, just one piece of a massive puzzle. Tierkreis is completely focused on not only the fact that these parallel worlds exist, but how they are related to each other. The lack of tactical battles really hurts the feeling of grandeur that previous games give. Going into a different screen where there are units to maneuver, tactics, and strategy to earn a victory is just much more satisfying. In Tierkreis you usually make one to three parties and each one gets a couple normal battles, maybe a boss battle, and then you’re on your way. The music is a big step down from the main series. Short loops make their return from the first Suikoden, but each area gets its own unique tracks. The visuals are quite nice for a handheld of the time, and most characters have multiple pieces of art to represent different emotions and facial expressions. The game even has voice acting! I do not care much for the voice acting on the main characters. It sounds like somebody gave the VA for the main character an extra $20 to say all of his lines as fast as possible, so he is hard to understand since words fly out of his mouth. He also has a lame catchphrase: “We don’t know what’s going to happen until we try!” That might make some more sense after you play the game though. The others range from good to mediocre, but with the game’s budget this is probably better than one might expect. Overall Tierkreis is a fine game for what is offered here. It works well, the story is a bit simpler than the main series entries, but it is worth a look even if you’re not a fan and are looking for a fun RPG to play on the go. If you’ve played the main games before this may feel underwhelming with all the changes and omissions, but the game is fine for what it tries to do and give the player. The story works well, but the localization is quite messy at times with punctuation, spelling, and grammar mistakes fairly consistent throughout the game.